Photo above: A chart from Gov. Hogan’s budget presentation Jan. 22. 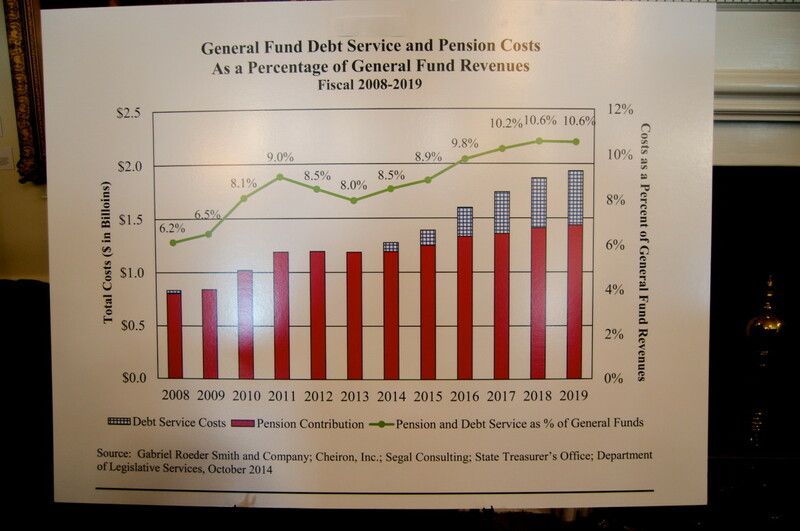 It shows debt service and pension costs (red bars). The green line shows increasing percentage of the general fund. The Maryland State Retirement System suffers from chronic underfunding—facing an actuarial shortfall for existing participants of $19.6 billion as of July 1, 2014. Fixing the shortfall will require decades of contributions’ discipline even while major demographic impediments and a clear risk of economic downturns (during the next 25 years) loom. The problem with that argument is those losses have been dwarfed by the markets’ 2011 through 2014 gains which saw the major market indexes soar, most more than doubling. Thus, the real problem is not the stock market; it is political complacency and a lack of contributions’ discipline. The Maryland State Retirement system covers state government employees, public school teachers and workers in 138 cities, towns and other political subdivisions. It pays more than $262 million per month to 143,000 beneficiaries ($3.1 billion per year). With more than 5,000 new beneficiaries being added annually, any instability or unsoundness of the system will adversely affect Gov. Hogan’s ability to manage the structural deficit, balance the budget and implement his campaign promises. There aren’t any red flags in Annapolis or the slightest indication of concern so far in 2015. Too much credit is being given the legislature’s pension benefit reforms enacted in 2011 and finance reforms enacted in 2013. The true causes—towering stock market gains—of modest improvements to the funded status (currently 67.7% funded, up from a low of 63.4% in fiscal 2010) recede into the wallpaper. Gov. Hogan’s budget indicates pension funding will reach the 80% level five years sooner (2021 rather than 2026) than previously forecast. But the budget fails to distinguish among the three causes — the legislature’s latest budget and pension reforms and the phenomenal stock market gains — or make plain the paramount cause wasn’t due to any action by the state. Moreover, the Department of Legislative Service’s generally rosy pension presentation during its legislative briefing last month sounded no alarm bells and failed to convey a balanced appraisal of the true causes of the fund’s improvements since 2011 or highlight the fact Hogan’s budget “backloads” 76% of budgeted pension contributions across the final three years (2018-20). State actuaries calculate an “annual required contribution” (or ARC), which is the amount the state needs to pay into the pension system to address the current year’s minimum funding requirement. Since state law didn’t require these amounts to be fully paid, the state has declined to fully fund the minimums for the last 12 consecutive years. As of June 30, 2014, the cumulative underpayments were $3.5 billion, of which $2.9 billion occurred during the O’Malley years. What is worse, the ARC method isn’t even conservative. A more reasonable method is to recognize the actuary’s system-wide liability, rather than its minimum actuarial funding requirement. Comptroller Franchot estimates this more conservative method will add $14.2 billion to the existing pension liability, although he cautions part of that liability belongs to employees, not the state. Effective this year, accounting standards will require the state to materially increase the pension liability it carries on its balance sheet based on this more conservative requirement. This will adversely affect the state’s equity, moving the fiscal 2015 balance sheet materially into the red, meaning the general fund’s statewide liabilities significantly exceed assets. So, what’s the current plan to pay these liabilities? A law passed in the 2013 session was meant to structure a long-term solution. That law required slowly re-paying (amortizing) the liability over 25 years. Each annual cash contribution would therefore cover: (1) a small portion of the $19.6 billion that came due mostly for the years 2003 – 2013; plus (2) 100% of each year’s new pension funding cost in the year it comes due. This law took effect in 2014. How did last year’s implementation work? The state failed to do either. Instead, it (1) declined to pay any part of $19.6 billion; and (2) failed to pay $598 million of the 2014 minimum funding due. This pitiful record raises questions about the state’s commitment to complying with the 2013 legislation. Demographics also will work against even the most realistic and best-laid plans and most favorable economic growth experience. Almost 38% of the state workforce will be eligible to retire in the next five years, and more than one-half will be eligible within 10 years. State officials label this the “silver tsunami” and because of these demographic headwinds at least one economist has argued the state doesn’t have 25-30 years to fix the problem. The economy will be another challenge because of the high risk of one or more economic downturns during the lengthy re-payment period. Bad economic times cause a double whammy because they impair state revenues and reduce the system’s investment returns. What about the bond ratings? But it warned that the “[f]ailure to adhere to plans to address low pension funded ratios” would be one of five events that could cause a rating cut. The retirement system’s annual financial report raises questions about how serious is the state about implementing the 2013 legislation and achieving full funding by 2039. An amortization (repayment) plan would show how the legislation will be met and enable an objective assessment of its realism. It would show how much “negative amortization” exists in the early years, and whether any back-loaded payments in the later years are realistic. However the system’s financial reports fail to convey any plan showing how the liability will be liquidated, and none can be found on its website. This plan of amortization should be presented in the future. In addition, the system should earlierimplement recommendations of standards-setting bodies such as the Actuarial Standards Board to make investment risk and its consequences clear. The pension system is far from insolvent, but it’s hard to see the combination of factors enabling the state to extricate itself from the jam its gotten into since 2003; even if the solution extends over the next 25 years, until 2040. Nobody expects the stock market to keep going up but a solid, growing economy and decades of sustained, unyielding pension funding discipline would go a long way. These latter two elements, however, are the precise ones the state neither fostered nor assured during the last decade. Higher taxes would mitigate the problem, but they would create generational inequities. We deserve honesty in Annapolis on this issue. The executive director of the State Retirement Agency responds to this article.